Continuing on from my trip report for Day 7 – I Can Show You The World here is our journey around America! As the taiko drummers came to an end, it started to rain – we were in the Japan pavilion in 2011 when the rain started to fall then! 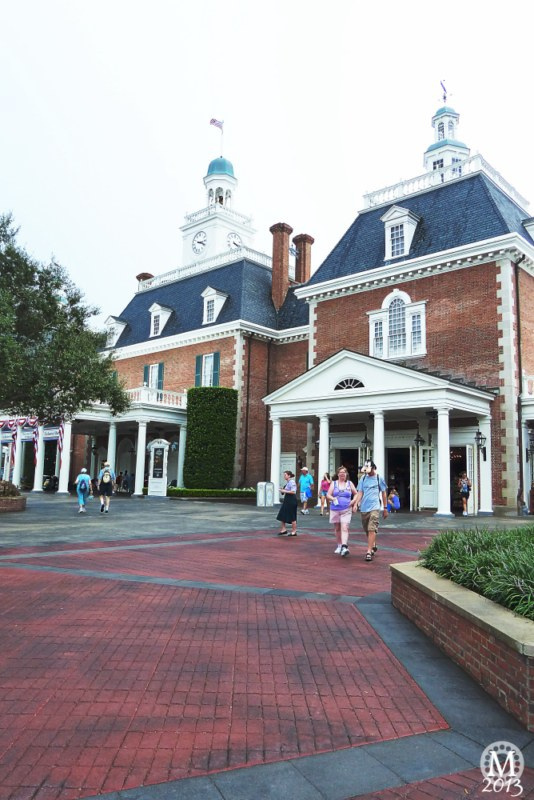 So we headed, as we did before, towards the America pavilion, or as it seems to be called, The American Adventure. We walked past the funnel cake stand and it started to pour so we bolted into the building where The American Attraction Adventure is and waited for that to start. Whilst waiting in the huge room with a domed ceiling, the Voices of Liberty – an Americana a capella choir came out. Dressed in period costume and staying completely in character, they sang several American folk songs, and sounded amazing. There was a blond woman who sang so high I thought she was going to burst a blood vessel! …they were lovely to listen to, and I really enjoyed the music. After they had finished we went upstairs to watch the show. The American Adventure is an animatronic show of the history of America, told buy Mark Twain and Ben Franklin. I love history, I don’t know much about America’s past, so learned stuff and found it fascinating. That’s another thing I love about Epcot, the things you learn as you go round a theme park! The Americans are full of patriotism and you certainly feel it as you go into the building that houses The American Adventure!